With silver and green variegated foliage Cornus alternifolia ‘Argentea’ is one of the more unusual Cornus varieties. The growth habit that develops over the years is one where the branches are layered and open. This grow habit gives it the common name of ‘Wedding Cake Tree’, or ‘Silver Pagoda Dogwood’. This particular tree will usually commence life with a bushy habit, it takes time to develop the tiered branching effect. 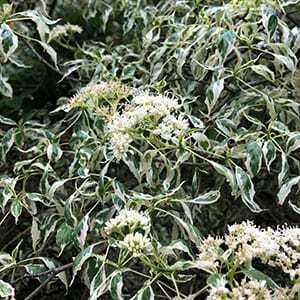 For a more immediate effect you might need to look for Cornus contraversa ‘Variegata’ which is a species from China. However, over time, it is a tree that develops into a most stunning feature tree and it is suited to smaller gardens. This is a deciduous tree, it will flower with small creamy white flowers in clusters in mod to late spring. It will reach around 4 metres in height with a spread of around 3 metres. It is frost tolerant and is best in a position away from the heat of the afternoon sun and hot drying winds. Grow it in a humus rich soil, mulch around it to maintain a cool moist root run and fertilise each year with cow manure and added compost.